← RIM on a Roll…. Are you on the ball if you own an Andorid? Are iPhone users smart and speedy? Are BlackBerry users the brainiest of the bunch? Here at Bango we decided to carry out a test to answer all these important questions and determine just how smart different smartphone users really are. Using Dr. Kawashima’s Brain Training and some willing volunteers, we aimed to find the differences in terms of brain power between iPhone, Android and BlackBerry users. Our first experiment tested the reaction times of each group of smartphone users with a game that reports on “brain age”, the higher the age, the worse the player performed. We recorded the difference between the age scored and the players’ actual age. Our results found that iPhone users had an average brain age 18 years older than their real age. Android users were 11 years older, and BlackBerry users were positively spritely at only 7.5 years older. The second experiment assessed their powers of mental arithmetic by testing their ability to make simple calculations at speed, the quicker the time and the more they got correct, the better the player performed. We tested the same users’ mental arithmetic skills and here the results were much closer. iPhone users just managed the fastest average time ahead of BlackBerry users by only 0.083 seconds. Android users were a full 9 seconds slower. So, what can we learn from our experiment? It appears that BlackBerry users, on the whole, were the smartest user group. Android users were pretty average and as good at number crunching as iPhone users were, they’re not aging well! 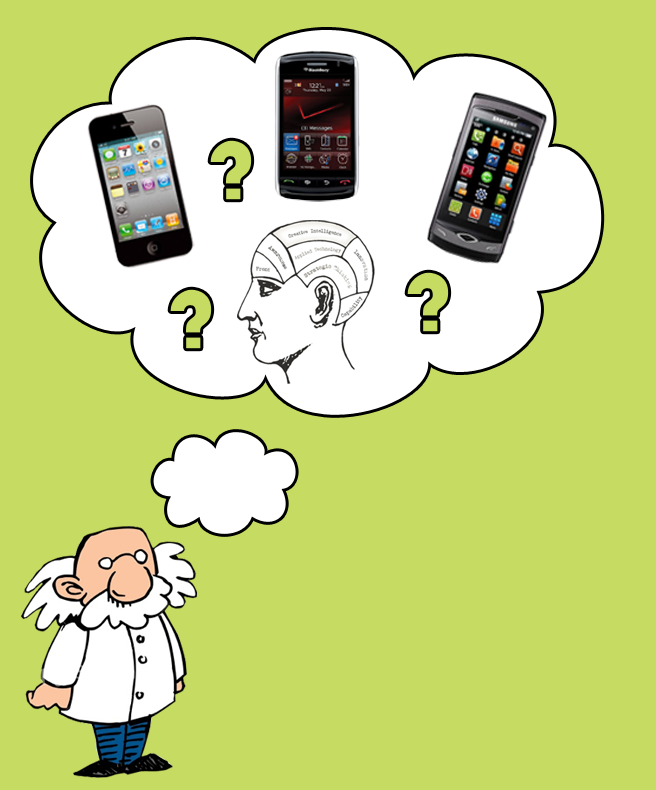 Could the iPhone simplicity and ease of use really be to blame for their slower reactions times and older brain age? Who knows! Try the test yourself and see how you fare. This entry was posted in Android, BlackBerry, iPhone and tagged iPhone. Bookmark the permalink. 1 Response to Which smartphone has the smartest users? What if I had previously an iphone, and then switched to Android? :).. Anyway, it was fun to read.